BYU ARTS Art Director Nick Mendoza and Designer Sam Reed earned a Grand Gold from the CASE VII 2016 Award of Excellence for their entry in the Design & Poster category. 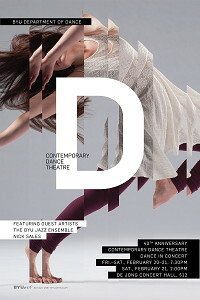 The entry was a poster designed in support of the university’s Contemporary Dance Theatre (CDT). It features one image cut into three pieces on three posters – as a metaphor for the various dance choreography combined in one show. We asked Nick if he would share more about the award-winning project. CASE VII: What was the creative assignment and how did the idea for the Contemporary Dance Theatre poster originate? NICK: Contemporary Dance Theatre performs on campus annually, and our studio is tasked with providing the marketing services for the event. We try to promote excitement for the upcoming event and encourage audiences to become supporters of the arts. We typically meet with the director of the event to go over the creative brief. The designers and I will get together, discuss ideas, create a mood board, and present a rough idea of the poster. 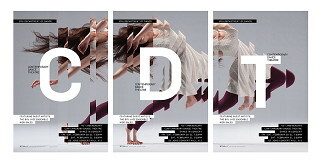 Contemporary Dance Theatre has a large range in dance styles—contemporary to hip hop—and we wanted to express the range in styles and movement of the dancers through various cut pieces of one image across three posters. CASE VII: What were some of the challenges in creating the design? NICK: Trying something new is always scary for our clients. I believe we have built a good rapport with the BYU Department of Dance, and faculty have been willing to let us experiment with our designs. It was difficult arranging the same event information on the three posters to unify them as one big poster and at the same time letting them stand alone if placing the three posters together was not possible. CASE VII: How did people respond to the posters? NICK: We have had very positive responses to this poster. It has given Brigham Young University, the Department of Dance, and BYU Contemporary Dance Theatre continual exposure beyond the event. We could not be happier with the positive feedback we have had from the community and organizations such as CASE. CASE VII: Was the show itself successful? NICK: This question can be a bit ambiguous to answer. Do you measure success of a show based on ticket sales? Or do you measure success of the show by an amazing performance? On both fronts I believe the show was successful and look forward to working on the next BYU Contemporary Dance Theatre event. CASEVII: What advice do you give your design and photography students? 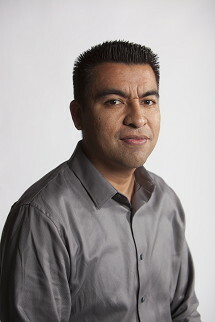 NICK: No matter how big or small the client might be, you must put your best foot forward. Show kindness and empathy towards your clients and those you work with. You might not be remembered for the designs you create, but you will be remembered if you were not kind or if you were difficult to work with. visit the site to know more. Welcome to the CASE District VII Best Practices Blog, where we highlight industry best practices by profiling district award winners and volunteers.